Columnists at two establishment media outlets, Poynter and the BBC, have broken ranks to criticize CNN’s Jim Acosta’s unprofessional grandstanding. 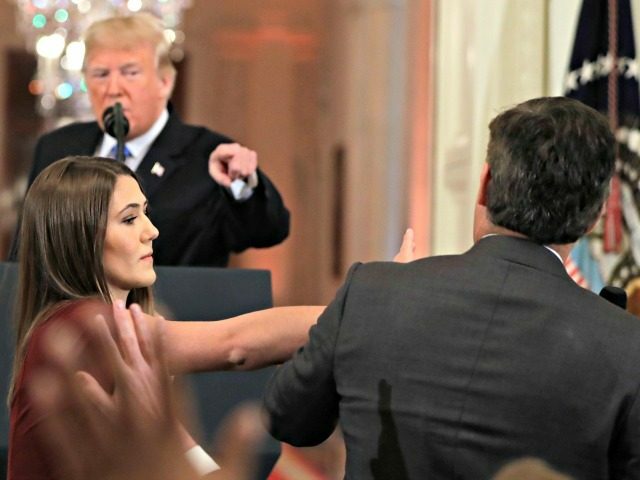 The White House pulled Acosta’s press pass this week after the left-wing anchor made a spectacle of himself at President Trump’s Wednesday afternoon press conference. To open the event, the president spoke about his desire to work with Democrats and to cool the campaign rhetoric. Acosta, however, only wanted to keep things ugly. Early in the presser, Trump called on Acosta. Rather than ask a question, though, Acosta chastised the president. The migrant caravan is “not an invasion,” he lectured. “They’re hundreds and hundreds of miles away, they’re not an invasion,” he said in a forum where the media is supposed to ask the president questions, not make speeches. Still, Trump responded; and Acosta argued with him again. Trump responded again; Acosta kept arguing. By all modern norms, this should have been the end of it. One question, one follow-up, and then you step aside to give your colleagues the opportunity to ask a question. But Acosta wanted a third question and then a fourth. He wanted to shame, lecture, and debate the president. Things got especially ugly when Acosta got physical with a much smaller, female intern who was just doing her job. Asked by her boss, no less than the president of the United States, to give the microphone to another reporter, assuming he would, she reached for it, and Acosta responded by twice whacking her arm. He probably would have continued hitting her had she not given up. To make matters worse, CNN and Acosta then proceeded to not only lie about Acosta not touching the intern, the far-left network falsely claimed the White House had “doctored” video it released that conclusively proved Acosta had gotten physical with the young woman. And so, Acosta loss his press pass and despite his objectively unprofessional behavior and physical aggressiveness, the establishment media rallied around Acosta — even though he eats up their time to question the president, even though he makes them all look bad as he forces them to huddle together like a demented cult and defend the indefensible. Two members of the establishment media, though, do deserve credit for breaking ranks, beginning with the BBC’s Emily Maitlis, who took Acosta to task for his appalling behavior. Jim Acosta was called on by the president to ask a question. I’ll say that again. He was called on by Donald Trump to ask whatever question he liked. And when he’d finished asking one, he then asked another – with interruption follow-ups in between. It was only when he attempted his third question – or possibly fourth depending on how you define the follow-ups – that the president got angry and asked him to sit down. What happened in that room was not the ultimate fight for press freedom. This wasn’t someone risking life and limb against a regime where freedom of speech is forbidden. This was a bloke sitting in a room full of colleagues who were all trying to ask questions too. This was a man who’d had his turn and had been told he couldn’t hog the whole time. The president took CNN’s question and then took more. And when he tried to move on, he couldn’t. Once the Acosta incident was over, he went on to take questions from journalists from all over the world – for a total of 90 minutes. Jim Acosta’s encounter Wednesday at a White House press conference was less about asking questions and more about making statements. In doing so, the CNN White House reporter gave President Donald Trump room to critique Acosta’s professionalism. If Acosta had asked “What about that seems like an invasion?” he could have both sought an answer and avoided becoming bigger than the event he was covering. But then Acosta’s questions ended and his statements began. “Your campaign had an ad showing migrants climbing over walls,” he said. And then, “They are hundreds of miles away, that’s not an invasion.” The heated exchange grew from there. A briefing is not the same as a cable news wrestling match, where sides shout at each other. Acosta should have handed over the microphone. What Acosta needs, for his own good and the good of the White House Press Corps, is the equivalent of a metaphorical blanket party. In the military, a screw-up making like hard for the rest of the platoon, gets covered in a blanket and roughed up. This is how a platoon disciplines itself. I am certainly not arguing for anyone to get physical with Acosta, but the concept still applies. If there are any adults left in the press corps (a dubious prospect), they need to take Acosta aside and tell him to knock it off. This can be done privately while still showing public solidarity. But if they care anything at all about their credibility with the public, that is what needs to be done.